Couples seek out therapy for many reasons, but one of the most common is to help their relationship recover from an infidelity. In fact, some research suggests that 30% of couples seek out therapy due to the damage of an affair, and couples who have experienced an affair are more likely to break up or divorce than those couples where there was no infidelity. These couples often feel as though the very foundation of their relationship has shifted, and the emotional pain of the secrets and lies surrounding the affair can be overwhelming. 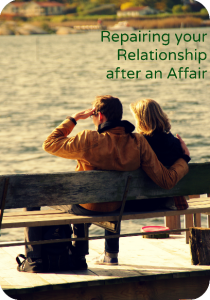 Repairing from the aftermath of an affair can be, and often is, incredibly difficult. Experiencing an infidelity does not always mean the demise of the marriage or relationship, and there are ways to approach the repair process that increases the chances of successfully moving beyond the affair. Here are 9 things to keep in mind as you navigate this repair process. Repair takes time. Going through the repair process with your partner after an infidelity can take time. Do not be surprised if this seems like a slow process, as it can take months – even a few years – to repair. The unfaithful partner needs to accept this reality, be patient, and avoid complaining about it. Be prepared for negative feelings to linger. Similarly, the hurt partner may have feelings of mistrust, upset, and anger that linger for quite some time. This person has been deeply injured, so expect these feelings to be a part of the aftermath of an affair. Realize that anything can be a trigger. The hurt partner can be triggered by almost anything – a smell, a news event, a song, a physical place, a particular time of year, or an object – and the unfaithful partner should expect this. Furthermore, the repair process can be elongated or delayed if the unfaithful partner is defensive or irritated by the hurt partner being triggered by any of these things. Infidelity never really ends well. With infidelity, there are really only different levels of bad outcomes. Even though you may have met a new partner via an affair, choosing to have an affair is always destructive in some way. Someone always gets hurt, and really, everyone involved feels the negative aftershocks of an affair. The offending partner should not express self-pity. There is no room for the unfaithful partner to express feeling victimized by the repair process. This is the time to own up to making a bad choice and do what it takes to heal the wounds created by the affair. True repair comes from the unfaithful partner taking initiative. Repairing the relationship after the affair often seems unbalanced to the unfaithful partner, because most of the attention should be focused on helping the hurt partner heal from the interpersonal trauma of the infidelity. This is, in fact, how to move past the affair. The unfaithful partner needs to step up to the plate, take personal responsibility for his/her choices, and work tirelessly to repair the damage of the affair. Showing this kind of commitment is an essential component of the repair process. The injured partner alone has permission to express negativity. Infidelity is often motivated by anger, resentment, or feeling hurt, but the unfaithful partner should not express these feelings during the repair process. Understand that having an affair is a choice. Even though both partners in a relationship are equally responsible for creating an interpersonal dynamic that is dissatisfying, unfulfilling, or problematic, engaging in an affair as a result of feeling this way is always a choice. No matter how bad you think your relationship is, that is not an excuse to have an affair. This cannot be stressed enough: Having an affair is always a choice, and the unfaithful partner is totally responsible for making that choice. The hurt partner may have trouble fully trusting his/her partner for years. It is not unusual for the injured partner to want access to his/her partner’s check credit card statements, phone records, emails, and social media for years after the affair is acknowledged. The unfaithful partner needs to find a way to accept this and accommodate the hurt partner’s needs without complaining.